Science fiction deals with a number of fanciful devices that permit light to interact in a forceful manner with matter, from photon-drive rockets to light sabers. In the past few years, science has indeed begun to catch up; a few results hint at attractive real-world interactions between light and matter at atomic scales. Devices such as vortex beams, tweezers and optical tractor beams have been developed by Researchers. A research team at MIT and elsewhere recently pushed through another boundary while exploring for such unusual contraptions, by developing in simulations the first system in which particles — ranging from roughly bacteria- to molecule-sized — can be manipulated by a beam of ordinary light instead of the expensive specialized light sources needed by other systems. The findings have been reported in the June 30th, 2017, issue of the journal Science Advances, by MIT Postdocs Ognjen Ilic PhD ’15, Ido Kaminer, and Bo Zhen; Professor of Physics Marin Soljačić; and two others. Most research attempting to control matter with light, whether by pushing away small particles or individual atoms, spinning them around, or attracting them, involves the use of refined laser beams or various other specialized equipment that greatly limits the kinds of uses these systems can be applied to. Our approach is to look at whether we can get all these interesting mechanical effects, but with very simple light. The team planned to work on engineering the particles themselves, instead of using the light beams, in order to make them respond to ordinary light in specific ways. For their first test, the Researchers developed simulated asymmetrical particles, known as Janus (two-faced) particles, only a micrometer in diameter — one-hundredth the width of a strand of human hair. These small spheres were made up of a silica core coated on side with a thin layer of gold. The two-sided configuration of these particles causes an interaction when exposed to a beam of light, and the Researchers discovered that this interaction shifts their axes of symmetry relative to the orientation of the beam. This interaction also develops forces that set the particles spinning in a uniform manner. It is possible for several particles to be affected at once by the same beam. The rate of spin can also be changed by changing the color of the light. The Researchers say that the same kind of system can be applied to develop a variety of manipulations, such as moving the positions of the particles. Eventually, it could also be possible to apply this new principle to move particles around inside a body, using light to control their activity and position, for new medical treatments. It could also find uses in optically based nanomachinery. Ilic says the study “enables dynamics that may not be achieved by the conventional approach of shaping the beam of light,” and could also make possible a variety of applications that are difficult to predict at this point. For instance, in several potential applications, such as biological uses, nanoparticles could be in an incredibly complex, changing environment that would deform and then scatter the beams required for other kinds of particle manipulation. However, these conditions would not matter to the simple light beams essential for activating the team’s asymmetric particles. Because our approach does not require shaping of the light field, a single beam of light can simultaneously actuate a large number of particles. Achieving this type of behavior would be of considerable interest to the community of scientists studying optical manipulation of nanoparticles and molecular machines. Soljačić stated that this work fits into the area of topological physics, a promising area of research that also led to the achievement of last year’s Nobel Prize in Physics. However, most of such work focused on specialized conditions that can exist in specific materials known as periodic media. “In contrast, our work investigates topological phenomena in particles,” he says. Topology has been found to be a powerful tool in describing a select few physical systems. Whenever a system can be described by a topological number, it is necessarily highly insensitive to imperfections that are present under realistic conditions. 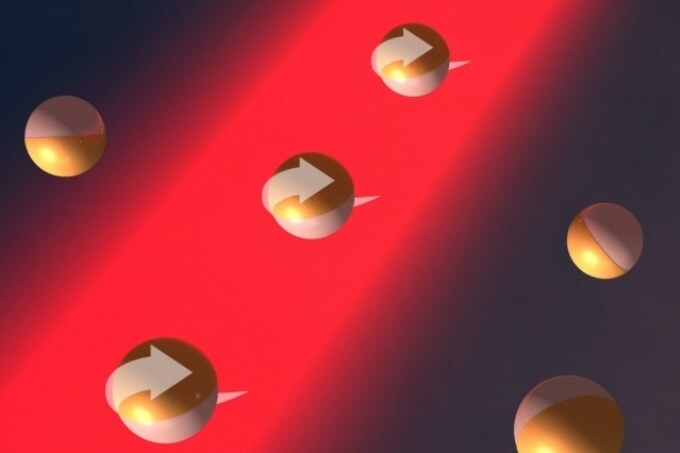 Soljačić's group has managed to find yet another important physical system in which this topological robustness can play a role, namely the control and manipulation of nanoparticles with light. Specifically, they have found that certain particles’ rotational states can be ‘topologically protected’ to be highly stable in the presence of a laser beam propagating through the system. This could potentially have importance for trapping and probing individual viruses and DNA, for example. The team also included Owen Miller at Yale University and Hrvoje Buljan at the University of Zagreb, in Croatia. The U.S. Army Research Office supported the work through the Institute for Soldier Nanotechnologies, the National Science Foundation, and the European Research Council.